Carrickfergus Grammar School Choir taking part in the BBC competition. The North Road choir, under the direction of Mr E Craig, has secured a place in the senior section of the popular competition. Over the course of nine weeks, 62 choirs battled it out for a place in the final. Presented by John Toal and Kerry McLean, the series has been recorded at seven venues with the senior semi-final programme broadcast on Sunday (March 31) from Regent House Grammar School, Newtownards, on BBC Radio Ulster. 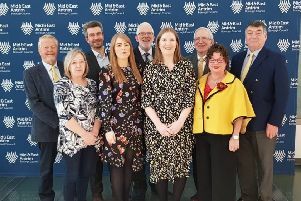 Carrickfergus Grammar was one of three schools which impressed the semi-final judging panel of Richard Yarr, senior producer Classical Music, BBC Radio Ulster; Ciaran Scullion, head of music, Arts Council for Northern Ireland and Rebekah Coffey, soprano and vocal coach. The live final is from the Ulster Hall, Belfast, on Sunday, April 7, which will also be recorded for the first time for BBC NI television. The competition is produced in association with the Ulster Youth Choir, and supported by the Arts Council for Northern Ireland (ACNI).